Well-equipped with features such as Android/Apple CarPlay powered infotainment, automatic headlamps, rain sensing wipers, auto climate control, etc. Have a question on Vitara Brezza? Vitara Brezza is available in 10 different colors - Blazing Red, Granite Grey, Pearl Arctic White, Cerulean Blue, PREMIUM SILVER, Autumn Orange, Fiery Yellow, Blazing Red With Midnight Black, Fiery Yellow With Pearl Arctic White and Cerulean Blue With Pearl Arctic White. Watch latest video reviews of Maruti Vitara Brezza to know about its interiors, exteriors, performance, mileage and more. Since half a decade or more, the under 4-meter segments have been the hottest and most talked about in the automotive space. The sub-4 meter space especially, the compact SUV segment have been dominated by Ford EcoSport for a long time and after Tata Nexon, it was the time for Maruti to roll out its trump card in the form of Vitara Brezza. 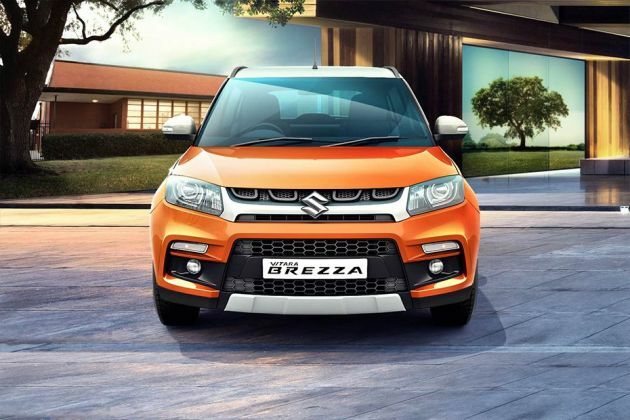 Launched in early 2016, Brezza has quickly become one of the most bankable vehicles from Maruti surpassing the 4 lakh sale milestone in less than three years of time. With all the right ingredients on styling, comfort and performance, Vitara Brezza has been dominating the under-4 meter space for a long time. The car has been cleverly designed to allure the young bloods of the country having heaps of features. Recently, the carmaker launched the new AMT variant with lots of aesthetic changes along with updated safety features. On the outside, the car remains tall and boxy just like an SUV should be. The upright SUV stance is carried forward with the right amount of flair in the form creases on the bonnet, muscular grille, sporty bumper and projector headlamps at the front. The grille also gets chrome finishing replacing the earlier silver painted one complemented by silver skid plate. The side profile is flanked by flared wheel arches and the new 16-inch glossy black alloy wheels. The floating roof design is reminiscent to Maruti Suzuki Swift and an important styling feature. The latest update also bestows the car with dual-tone colour option which really enhances its outer appearance. At the rear, the Brezza features wide stance with horizontally placed tail lights, silver finished skid plate on the bumper and contrast matte black cladding surrounding it. The spoiler also add hint of sportiness to the car. Dimensionally, the compact SUV measures 3,995mm in length, 1,790mm in width, 1,640mm in height while the wheelbase and ground clearance stands at 2500mm and 198mm respectively. The car is available in 9 graceful colour options including Blazing Red, Pearl Arctic White, Premium Silver, Fiery Yellow, Autumn Orange, Granite Grey as well as dual paint schemes such as Blazing Red with Midnight Black, Fiery Yellow with Pearl Arctic White and Autumn Orange with Pearl Arctic White. The carmaker has given a clever thought while designing the interiors. The car is spot-on when it comes to ergonomics with tons of contemporary goodies. The car gets all black interiors along with silver accents replacing the earlier dark grey. In the comfort zone, you will find automatic climate control, electrically adjustable and foldable ORVMs, tilt steering, height adjustable driver seat, automatic headlamps, rain sensing wipers, rear seat headrest and push engine start/stop button. In terms of infotainment, the buyers will get SmartPlay touchscreen infotainment powered by Android Auto and Apple CarPlay. The unit also gets navigation system along with usual connectivity options including USB, Bluetooth and Aux-in. The car is big enough to absorb five adult occupants with the 328L of boot space is sufficient to hold large luggage. The practicality is further evident with the fact that the car provides loads of storage and utilities such as 60:40 rear seat split, sliding front centre armrest with storage, back pocket on front seats and all doors with 1L bottle holding capacity. As far as specifications are concerned, the Vitara Brezza is only available in diesel engine option. The 1.3L powertrain is tried and tested and good for making 90PS and 200Nm of max torque. The transmission options include 5-speed manual and recently included 5-speed AMT. The engine and the manual transmission make it a fun-to-drive car on the highways while resulting in a bit of effort in the cities. The AMT transmission on the other hand, has improved the driving experience in the cities and offers smooth power delivery. The fuel efficiency has been the talking point of this car with both the manual and automatic variants are capable of delivering 24.3kmpl, certified by ARAI. Talking about the safety, the car comes equipped with dual front airbags, ABS with EBD and rear parking sensors as part of standard fitment. The SUV is now compliant with the pedestrian safety norms as well as comes with standard aspects including ISOFIX child seat anchorage, front seatbelt pretensioners with force limiters and high-speed warning alert. Moreover, moving up the variant ladder, you get reverse parking camera, reverse parking sensors with infographic display, front fog lamps, anti-theft security system and rear wash & wipe. Maruti Suzuki has cleverly priced this car, invading numerous under-4 meter segments. The Maruti Vitara Brezza price for the manual variants starts at Rs. 7.69 lakh and goes up to Rs.10 lakhs while the diesel automatic variants come in the price range of Rs. 8.85 lakh and Rs. 10.62 lakhs. Maruti Vitara Brezza competes against the like of Ford EcoSport, Tata Nexon and Mahindra XUV300 in the segment. In terms of interiors, the carmaker has played cleverly, not going overboard neither degrading the quality and fit and finish too much. After all, the car had to be placed in the affordable range. The Maruti Suzuki is offering simple, sophisticated and value for money solution as against other compact SUVs in the market. There is glossy black finishing at the central console while the dashboard has been given a matte black tone. The brushed aluminum strip runs across the length of the dashboard breaking the monotony of singular colour as well as adding a dash of bling to the styling. With the latest update, the car gets all-black interiors with silver inserts as against dark grey in the earlier version. Moving to the lower part of the central console, here you will find auto climate control system along with some space for storing knick knacks. Above it you get touchscreen infotainment system powered by Android Auto and Apple CarPlay. The unit also works as a display for reverse parking camera as well as feature navigation and connectivity options including USB, Bluetooth and Aux-In. The infotainment is coupled with 4-speakers and 2 tweeters. The instrument panel features a simple layout and easy to read through. The speedometer and tachometer gets two large analogue dials with mood lighting which offers five different colours to choose from including red, blue, orange, yellow and white. In the center, there is apt sized multi-information display that shows info for engine temperature, fuel level, odometer digital readouts, two trip meters, outside temperature and average and instant fuel economy. And this does stand out from the rivals such as TUV300 which comes with monochrome display. Other comfort features in the Brezza include automatic headlamps and rain sensing wipers, cruise control, electrically adjustable and foldable ORVMs and push engine start/stop button. So, in terms of gadgetry the car seems to be well-equipped. However, the plastic quality is quite second-rate with average tactile feel. Also, the textured plastic on the dashboard feels a bit tacky. Moreover, the central panel does not feel as solid as in other cars in the same segment or hatchbacks that similar in price. It has instead large gaping in the panels that looks a bit weird. Coming to the seating and space, the driver gets height adjustable seat which is a good thing. The driving position also gives a nice view of the road ahead. The front seats are quite comfortable offering an overall good support and cushioning. The car also scores brownie points when it comes to rear seating and space. Here the car offers nice legroom which is because of raised up front seats and excellent under thigh support. The scooped out door panels at the back also look good and that makes space for the third passenger to sit comfortably. Moreover, there is plenty of headroom for the average passenger despite the slanted roofline. Having said that, the inclusion of leather interiors could have upped the ambiance and comfort inside but unfortunately Maruti didn’t added leather seats not even in the top variants despite of the high demand. On the flipside, Maruti Suzuki has always been criticized for not offering practical storage spaces in its cars. But this time around, the situation is different. The Vitara Brezza is a practical car with lots of storage and utilities across the cabin. It gets 1L bottle holder at all each door along with bottle holder on the front door cards. But many people would find it disappointing of not having rear ac vents in the car which has become a norm. Further, you get two cup holders placed in the central console which also gives room for storing a phone charger or other such utilities. The upper glovebox is cooled in the top variants while there is rear armrest with cup holder. There is also concealed seat undertray and back pockets on front seats. The 328L boot space might look average but the low loading bay makes a practical case for storing more luggage. And with the rear seat base flipped, you haul more cargo. The boot also contains a 12V socket and a baggage hook as well as storage space on either side which is certainly a practical effort from the carmaker. The car is striking to look at without an iota of doubt and that’s what an SUV is meant for i.e. catching the eyeballs of the passerby. The design and styling is spot on as the moment you look at it, you will find hard to figure out whether it’s a sub-4 meter SUV. It looks much bigger than it actually appears. And the manner in which front is angled lends the car an aggressive and wider look. The front profile features detailed chrome grille connecting the 2 headlamps together. With the latest update, there is a dash of chrome added above the existing grille. The top of the range version will get projector headlights setup with daytime running LEDs. The sportier bumper gets huge blackened air dam accompanied by silver skid plate. Below, the fog lights and indicators are separated and surrounded by matte black finishing. Turn around and you will see flared wheel arches and the black plastic cladding dominating the lower profile of the vehicle. Where the base variants get 16-inch steel wheels, the top variants in the latest update get 16-inch all-black alloy wheels. These are now way better and sportier than the earlier ones which lacked aura and plain jane in terms of design and style. Talking about the roof, the floating design reminds us of Maruti Swift and perhaps the most significant styling feature in the car. And what make it more bewitching are the newly added contrasting colour options on the roof. But what is disappointing is that the dual-tone colour options can only be availed in the top of the line ZDI+ variant. And yes, the roof rails have functional mounts so don’t be worried about it. At the rear, Brezza is wide featuring horizontally stacked tail lamps and the huge Vitara Brezza badging in chrome above the number plate area. The tail lamp cluster comes with the ‘bull horn’ LED light guide. The variant badging has been removed this time around. The rear number plate housing gets a chrome treatment in the latest update. The bumper at the rear gets skid plates finished in silver which goes well with the matte black cladding. Rear spoiler adds a dash of sportiness in the vehicle. Overall, the car has been well executed in terms of design and styling. Fuel efficiency is the most talked about thing of this car. As per ARAI test cycles, the Vitara Brezza SUV can deliver an impressive mileage of 24.3kmpl with both the manual and automatic variants. However, the rear world figures would be certainly different and you can expect this car to churn the mileage output of around 17-18kmpl. The ride and handling of Maruti Vitara Brezza is what a tall SUV should offer. There is quite a bit of body roll on the move but the suspension system which is on a firmer side is capable of tackling it. If there are two occupants in the vehicle, they will experience a fair amount of bouncing as well as skipping that comes along especially when the car is driven on bumpy and uneven roads that we are used to. However, when the car has full load of people, this problem disappears. The rear seat ride quality is nice and the plus point is that the car does not bounce like some other SUVs. As far as experience at corners is concerned, as the car is similar in setup like that of Duster, both these vehicle love to be thrown into the corners without breaking a sweat. Maruti Suzuki is always known for making cars with neutral handling dynamics and this one based on the Suzuki’s new C-platform is no different. In fact, Brezza is the first in India to get this new platform. While taking a corner, there is a bit of understeer but if you slightly lift your foot off the throttle pedal, the car gets back in line in no time. Vitara Brezza sources its power from the 1.3L 4-cylinder turbocharged diesel engine which is capable of producing 90PS and 200Nm of max torque. This is the same engine working in variety of other siblings including S-Cross and Ciaz. The powertrain comes mated to 5-speed manual transmission which is especially tweaked for this car. Sit on the driver’s seat you will feel a strange sense of familiarity. The car drives quite identical as other siblings such as Baleno and Swift. The power delivery is linear and though you will feel noticeable lag in turbo at low speeds with high gears, if you drop it down a step or two, the vehicle really started to show promising performance. The 5-speed transmission gives usual smooth and crisp experience but at the same time not as firm as in Swift. Maruti must have tuned the linkage or bushing mechanism to make the gearbox suppler. The clutch on the other hand, comes handy and light, while the point of bite and the free-play of the clutch are also very much accessible which results in less fatigue during start-stop traffic. When it comes to NVH, the Brezza is a bit coarse while moving with the noise filtering into the cabin when the motor is revved beyond 3000rpm mark. That said, the tyre and engine noise is slightly on a higher side that means if you are going for long journeys, the continuous noise can annoy you. Overall, when it comes to performance, the diesel engine with the manual transmission neither disappoints nor gives absolute performance. As far as AMT is concerned, these are meant for mostly to meet some end rather than giving comfortable driving experience. They have their own set of problems. But it is absolutely a surprise to drive the AMT loaded Brezza. The shifts in the urban areas are enjoyable and typical. Though the gear changes are not completely comprehensible but practically you wouldn’t find any head nod and the computer working behind is capable of holding gears a bit longer. That means the gears refrain from shifting up and down in the traffic frequently. In the automated manual, the carmaker seems to have muffled the throttle response which means you have to push the accelerator if you really need more power. On the contrary, the take-off is pretty smooth and while driving within the urban premises, sometime you would feel you are driving Brezza with manual transmission. The automated manual transmission is quite dexterous in hiding the sudden squirt of acceleration the moment turbo kicks in, it further enhances the driving experience. But on the other hand, when you want to move on, you would notice the gear shifts are not expectedly quick. However, switching on to the manual mode and easing the throttle while shifting can take care of this problem. The brake feel of the Brezza is on the positive side and though the vehicle does take a little dip from the front during heavy braking, there isn’t any fuss behind this maneuver as a whole which leads to good stopping. And here Maruti has done another needed addition in the form of ABS with EBD as standard. This give you more control over your car. In terms of safety, other standard features include dual front airbags, rear parking sensors, front seatbelt pretensioners with force limiters, ISOFIX child seat anchorage and high-speed warning system. The top variants get, reverse parking camera, rear parking sensors with infographic display, anti-theft security system, rear wash & wipe and front fog lamps. I could be buying a Brezza now!!!! What is the price of Maruti Vitara Brezza? On road prices of Maruti Vitara Brezza in New Delhi starts from ₹ 7.28 Lakh for base variant LDi, while the top spec variant ZDi Plus AMT Dual Tone costs at ₹ 10.33 Lakh. What are the colors options available in Maruti Vitara Brezza?